Garmin is expanding its fitness tracker family with the introduction of the Vivofit 3, a sub-$100 band that will automatically recognise activities and comes with a more eye-catching look. Now into its third generation, the Vivofit 3 has been in need of a makeover so it's slimmed down and now includes a smaller screen. In a bid to make its sporty band more fashionable, you now have the option to swap out the bands for a host of different funky styles. We'll reserve judgement on how nice they look when we see them up close though. The essence of the device is the same as before. This is going to offer you baseline tracking. So it will monitor steps, distance, calories burned, automatic sleep tracking and let you see the time. It also includes the great Move Bar, which keeps an eye on your inactivity and will help keep you motivated to hit those daily goals. You don't get a heart rate monitor like you do on the Vivosmart HR or the new Vivoactive HR, and it also lacks any smartphone notification support. There's no built-in vibration motor either, so you can't use it for silent alarms to wake you up in the morning. Aside from the new look, the big new features include the addition of Garmin's Move IQ software. That means the Vivofit 3 can automatically recognise and track a range of activities including running, cycling and swimming. It'll now also track intensity minutes to help more accurately capture data during the day and feed back into the Garmin Connect companion app. Like it's predecessor, it has a year long battery life, so there's no need to carry around a proprietary charging cable. It uses the kind of standard coin cell battery you put inside an analogue watch, so it's a cheap exercise to get it powered up again. 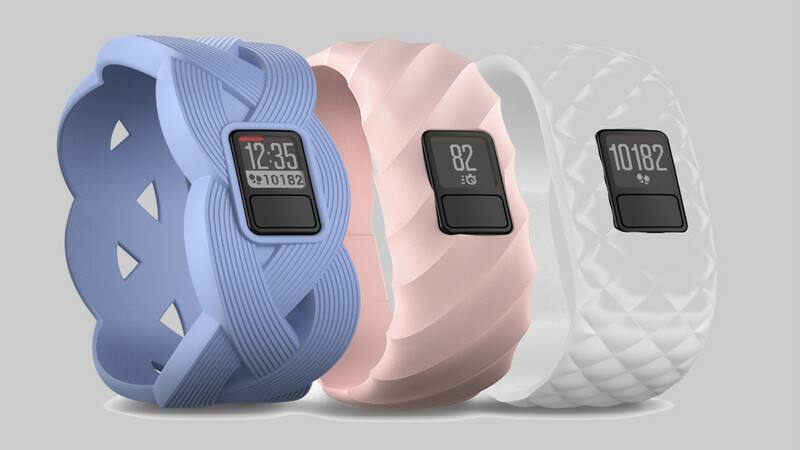 The Vivofit 3 is going on sale later this year and is going to be priced in at $99.99. There'll be a series of bundles available in regular or extra large band sizes, that could push the price up to $119.99. Interchangeable accessory bands including a range by designer Jonathan Adler will also be available in packs of two and will cost $39.99. The Vivofit 3 will be on show at MWC in Barcelona, so expect to get our first impressions on this budget fitness tracker in the not too distant future.